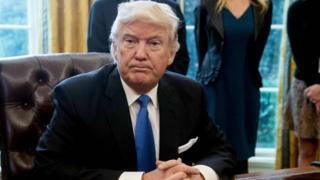 Donald Trump has said a “big day” is planned on national security, including an announcement to build a wall on the border between the US and Mexico. Mr Trump is also expected to introduce “extreme vetting” of people coming from seven predominantly Muslim countries in the Middle East and Africa. Building a 2,000-mile wall along the Mexican border was one of his key proposals during the presidential election campaign. Later this week, Mr Trump is expected to announce immigration restrictions from seven African and Middle Eastern countries, including Syria, Yemen, and Iraq. He’s also likely to halt access to the country for some refugees – until the vetting process can be made more rigorous. The BBC’s David Willis in Washington says immigration and humanitarian organisations are likely to be outraged by the measures. BBC North America editor Jon Sopel commented: “Throughout this week the new president has been making a series of down payments on his most high-profile election pledges.